People asked us why is the exact size for PowerPoint templates. The answer to this question is that there is no particular size in pixels for PowerPoint templates. Microsoft PowerPoint scales the content in the template to fit the screen display that is used at the moment. This is a good news for many, since you don’t need to bother so much about the PowerPoint template size. For templates that are intended to be used on screen presentations, we’d recommend you to use the default projector size that usually is 1024 x 768 px. For best results you can try to match the same proportion of the presentation. The classic resolution for computer screens, and also used as default for PowerPoint templates are: 800×600, 1024×768, 1152×864 and 1280×960. However, nowadays it is becoming most popular the wide horizontal layout, in particular when using PowerPoint templates or projection on HDTV. HDTV screens and beamers usually use the 1280×720 and 1920×1080 resolution and aspect ration 16:9. However, modern beamers and TV also use 16:10 which is wider. 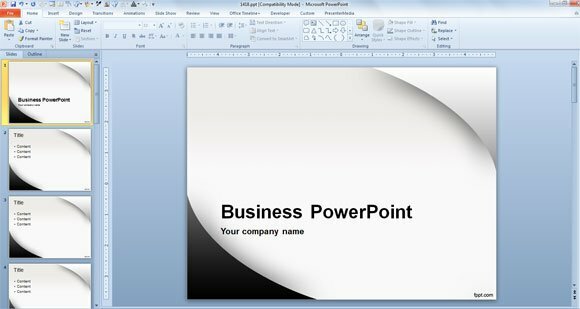 If you have a wide PowerPoint template or presentation and want to convert it to the normal layout, you can follow the instructions responded here. You can set the aspect ration in PowerPoint by going to Design tab and then choose Page Setup. A list of options will come and you can choose the output desired for the presentation.